Last Saturday my husband treated me to a Valentine's themed chocolate cooking class at our Ritz Carlton. My mom actually called him, said I'd love it and she would watch the kids. Yes, I am spoiled like that. Anyway, I checked out the menu, realized I had made everything on it on multiple occassions, and still said "yes!" I mean how often do you get to watch someone make chocolate while sampling and having a champagne flight on a Saturday afternoon. Other than sipping champagne, my favorite part of the class was watching (and sampling) the truffle making. They are so easy to make, but it had been years since I had done it. The recipe is pretty basic, the cool part is the flavorings. Just search on google for gourmet truffles and you can come up with amazing flavor combinations, like ginger & wasabi, earl gray tea and candied violets. Why pay those crazy prices when you can make them with so little effort! *I am making Cinnamon Cayenne Truffles, so I need a few cinnamon sticks & 1/4t of cayenne pepper and a few chocolate graham cracker crumbs to roll them in. Step 1: Heat cream in small saucepan until it is almost boiling. If you are infusing something in the cream, heat it very slowly on low so it has a chance to really flavor it. You can use tea bags or whole spices. If you use an extract or liquor, you can just mix it in during the next step. Step 2: Pour the simmering cream over the chocolate. 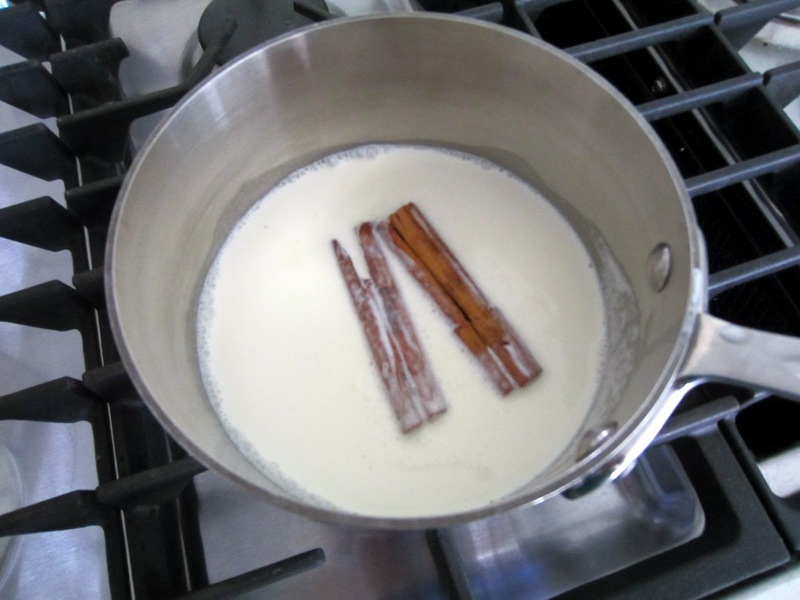 Use a strainer if you have cinnamon sticks, cloves, star anise, or anything else solid. Add any spice, liquors or extracts at this point. Allow to sit a minute and then stir until smooth. Allow to cool completely. Step 3: Transfer cooled mixture to a ziploc or pastry bag, cut off a corner and pipe hershey kiss shapes unto a baking sheet lined with parchment or silpat. Step 4: Allow to set an hour or so, you can momentarily put them in the fridge to speed up the process - but do not leave them there, the moisture adversely affects the chocolate. Now you carefully scrape them off and gently roll them into a ball. I put mine in the chcolate graham cracker crumbs first & then rolled in a ball. They will be a little soft still, so the crumb coating helped with keeping them together. If you don't want to do a crumb coating, you can do nuts, coconut or even dip them in melted chocolate. Have fun! I think my next batch is going to be sea salt & caramel - still trying to work out the caramel. Thinking I am going to sub some of the chocolate for those brachs caramel squares and then dust with a little sea salt. Please share if you have any other cool flavor ideas! What a lovely thoughtful gift! I love making truffles, they are so easy and they make everyone think you're a genius! I make a coffee flavoured one that is to die for. Oh! So good! I've not tried making these but this is twice today I've seen easy recipes. I think those are sure signs I should be making some, don't you? Courtney, when you figure out the salty caramel ones, please share. Those sound so delish!